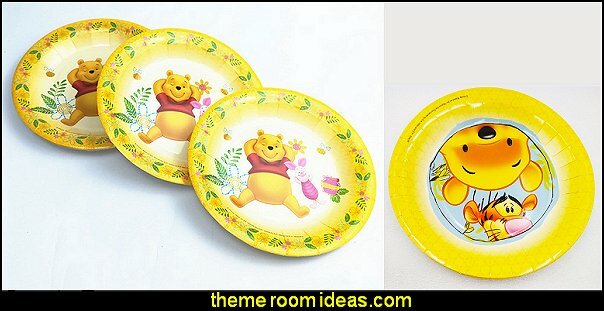 or picnic party in the Hundred-Acre Wood! 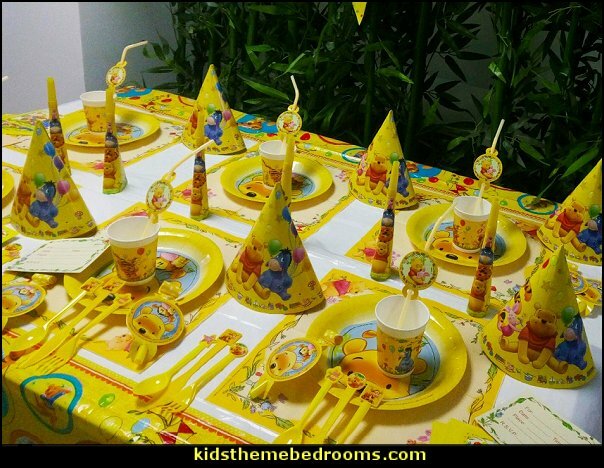 backyard spring and summer gatherings for kids and adults. 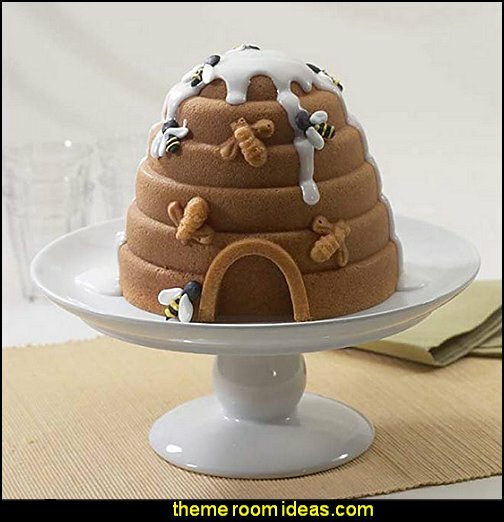 What will it Bee? 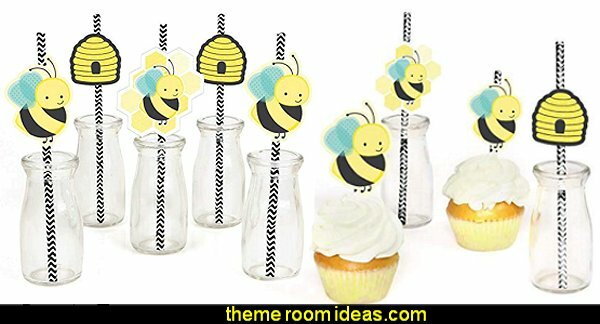 gender reveal party or baby shower, 1st or 2nd birthday for toddler girls, or Meant to Bee bridal shower. 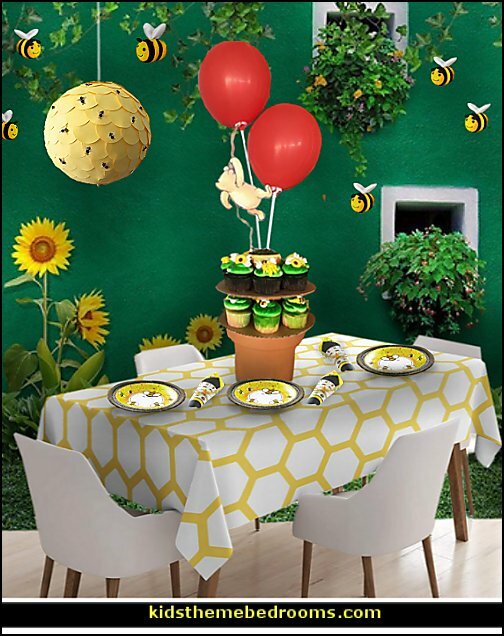 The perfect spring or summertime party addition is this adorable Bumblebee Mylar Balloon with it's yellow and black stripes and pastel blue wings. 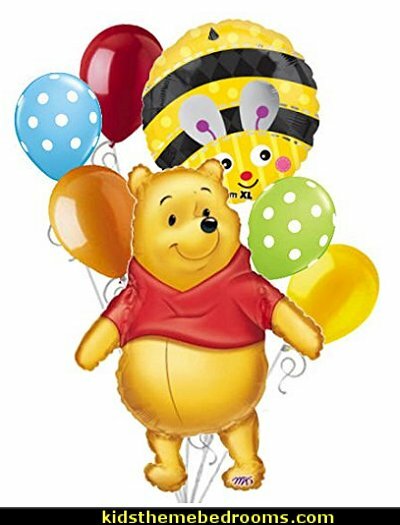 Each Bumble Bee Balloon is made of foil and measures 18" high x 18" wide. 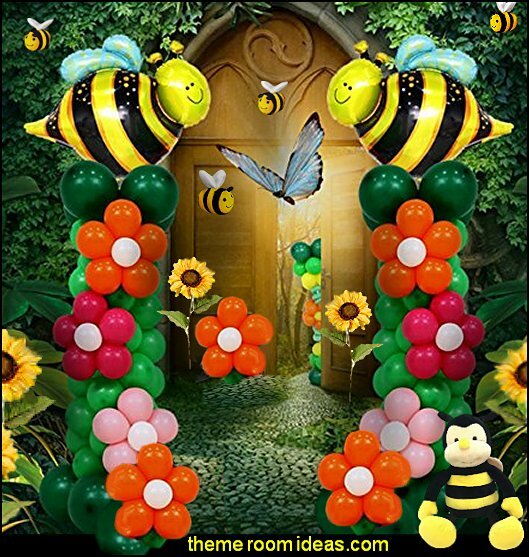 Add coordinating latex balloons, curling ribbon and a balloon weight to create a fantastic balloon bouquet for your next bee themed party! This beautiful piñata is covered with paper petals and applied bees. There are 4 pull-strings. You also get 2 packs of confetti (one blue and one pink). Made of gold glitter card stock. Glitter will not fall off. The banner is PRE-STRUNG, you may space the letters and patterns to achieve the look that you want. 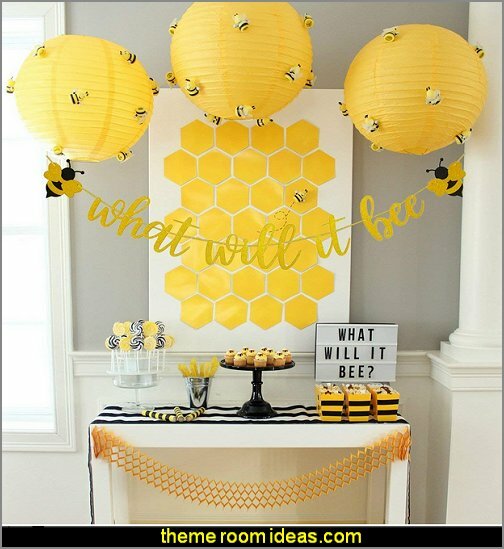 The banner will be perfect for your bumble bee gender reveal party or baby shower! 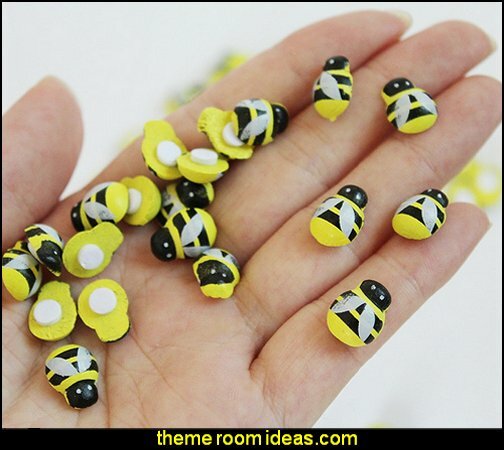 Create a buzz and decorate with a bee theme for a spelling bee in the classroom at school. 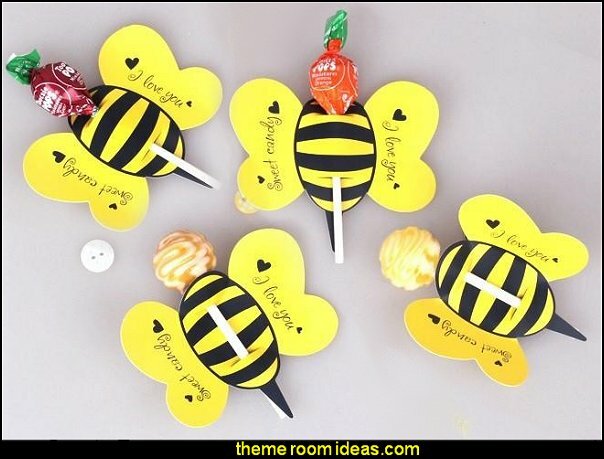 See what the buzz is about with our Buzz Beehive Personalized Standee! 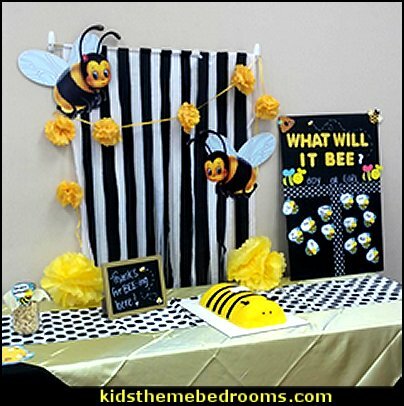 This adorable, free-standing cutout features a beehive design accented with honeybees, along with your custom text. 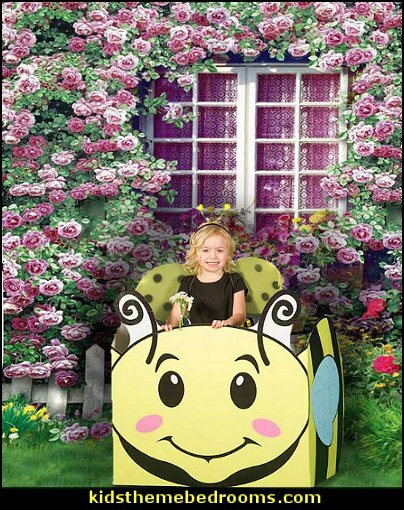 Your kiddos will love posing for pics next to this Buzz Beehive Personalized Standee. 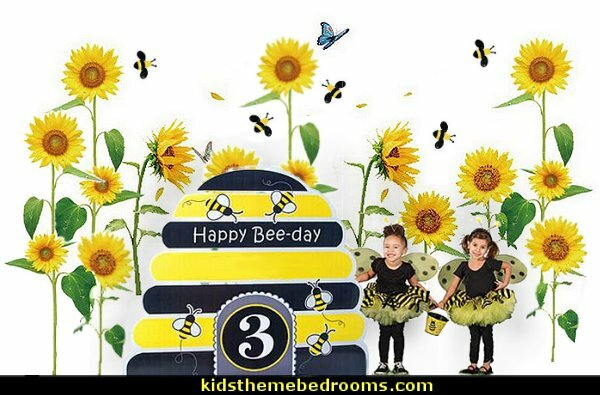 Our Buzz Bee Sit In Prop is a three-sided yellow and black bumblebee prop that allows kids to sit inside. 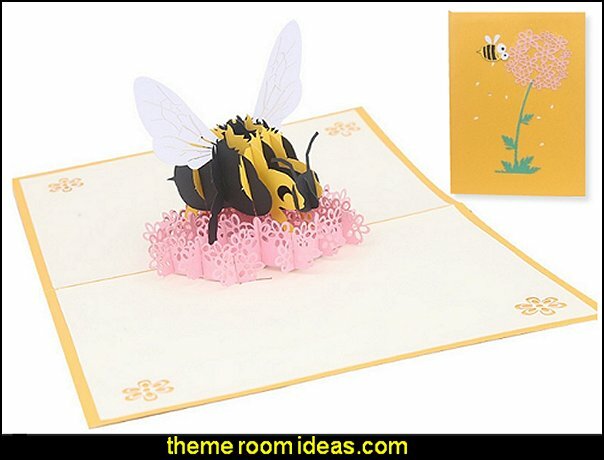 Each Bumblebee Sit In Prop is printed on cardboard measuring 30" square on each side. 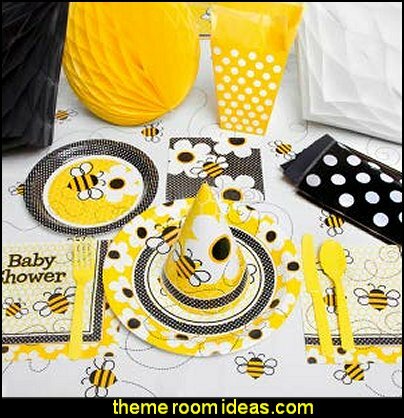 These elegant bumble bee party supplies will be the hit of the honey bee hive dessert display for a baby bumble bee 1st birthday or sweet Mother to Bee baby shower for a girl. 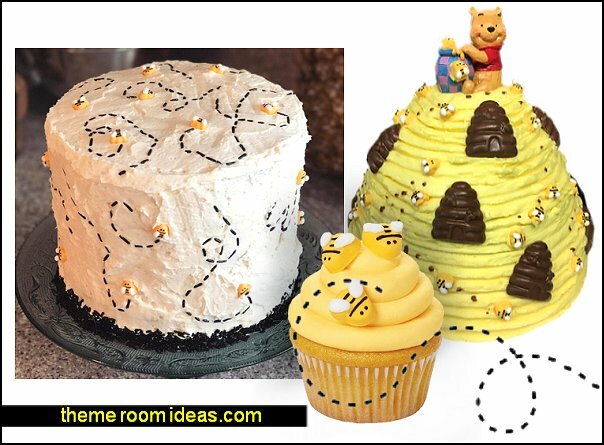 Honey, these are too cute! 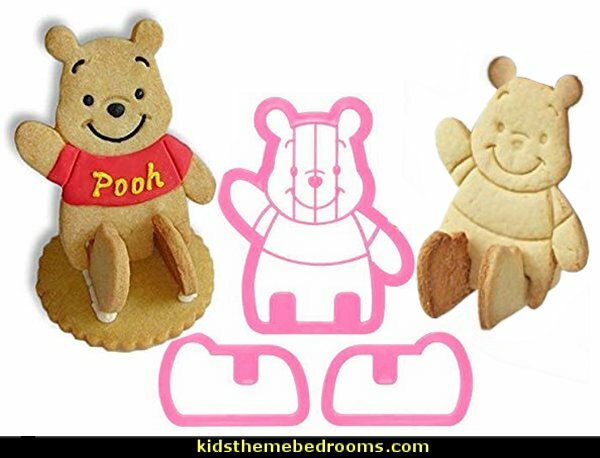 This 3D set can make Winnie the Pooh either sitting or laying flat. 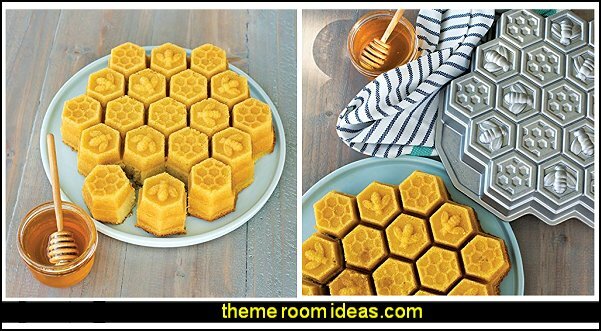 The pan includes a delicious Beehive Cornbread Cakes recipe. 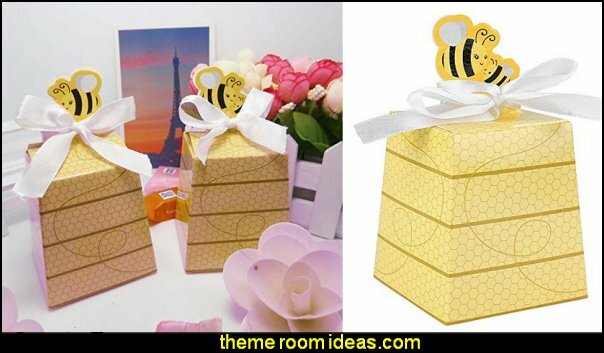 Mini hives and bees will have your guests a buzz with delight. 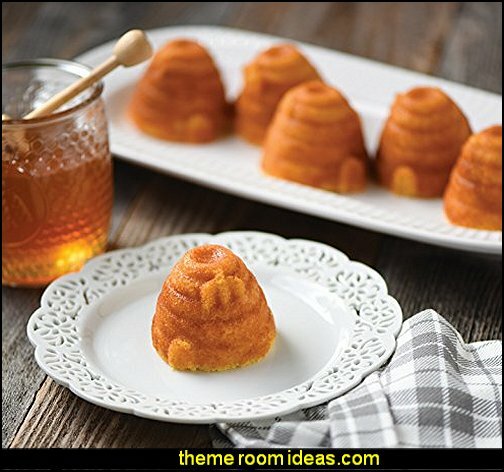 bread, molded deserts and savory dishes, as well as cake. 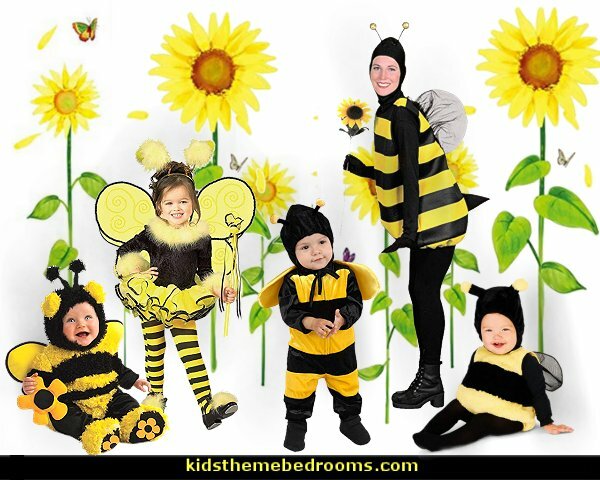 There’s a lot of buzz about bees! 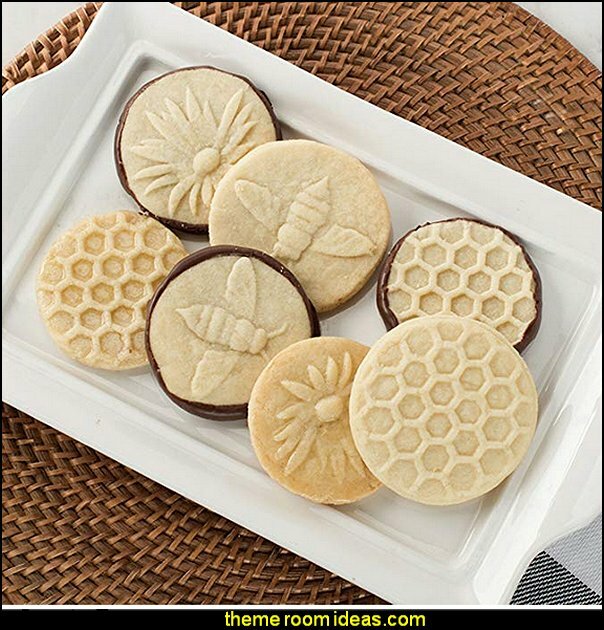 imprint cookies with bee, flower and honeycomb designs. Trending and timeless. Simple, yet sensational. 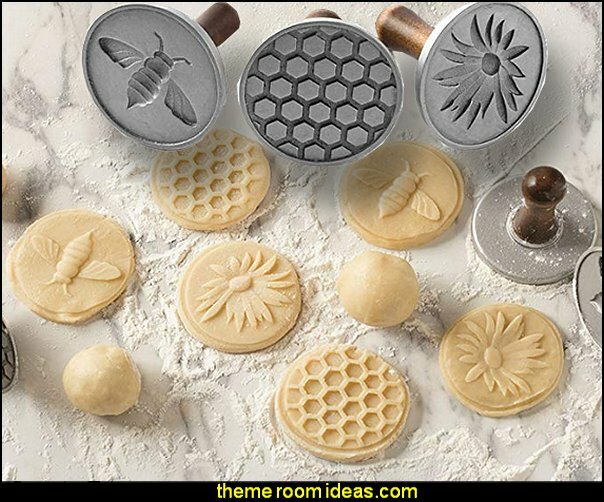 Be sure to flour the stamps between using and to use cold or chilled dough. PUT BACK IN FRIDGE BEFORE BAKING for 3 to 5 min or until chilled. 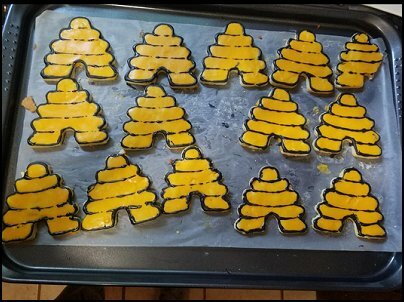 The impressions will "POP" on the cookie. 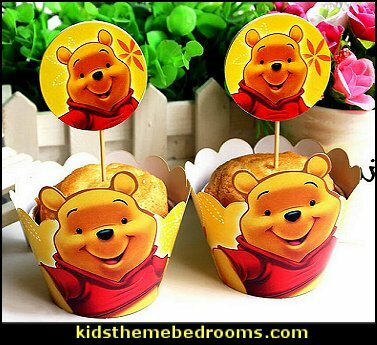 This is for a fun Disney Winnie the Pooh and Friends Cake Toppers Cupcake Decorations Set which will help make any cake the hit of the party! 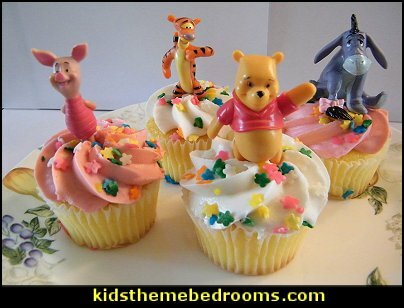 This nice quality set includes all the popular Winnie the Pooh characters including Piglet, Tigger, Eeyore and of course Winnie the Pooh! 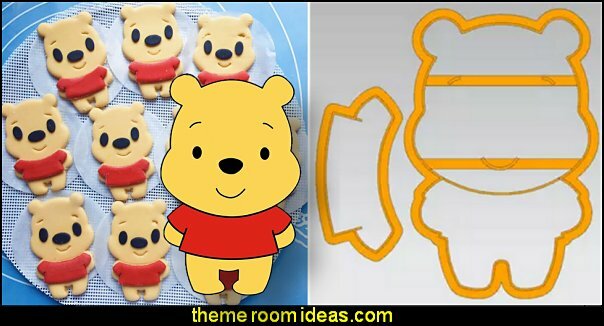 These figures are great for any Disney Winnie the Pooh fan and also make great gifts or even party favors! 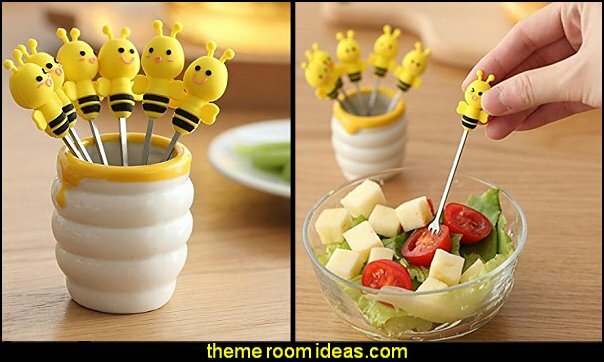 The handles are designed as cute bee shape, which are made of soft silicone for comfortable grip. 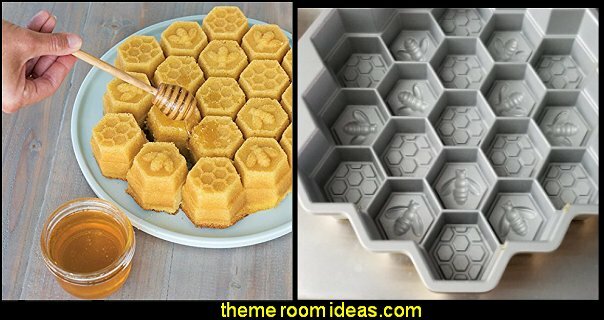 Perfect for fruit, mini cakes, pastry, salad, appetizers, etc. Bee loved. That's all any baby wants, and mom is always there with a never ending supply. 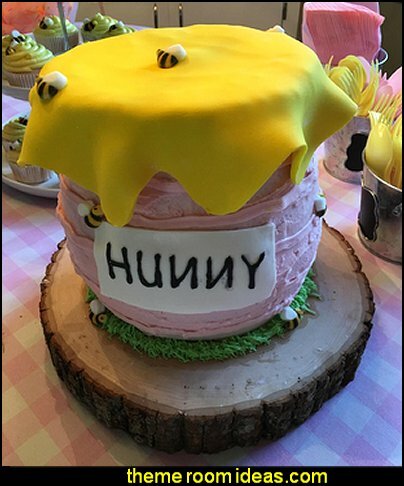 Kate Aspen's honeybee hive favor box shows baby honeybee loved by a happy honeybee mom guaranteed to get a warm smile from every guest. and enjoy a blast from the past! Put on your shades! it's time to Cruise! 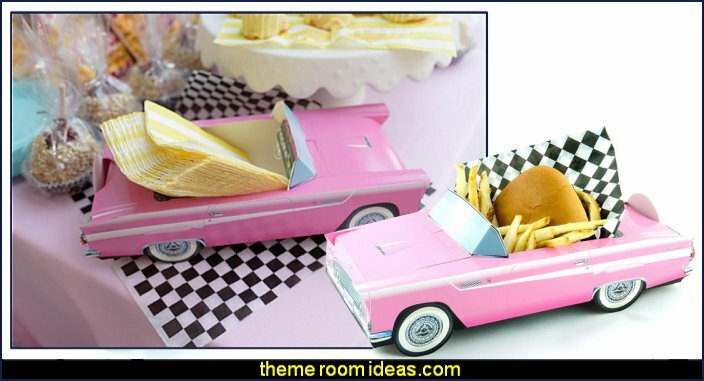 Have a blast with the Pink Cadillac Convertible photo prop. This item is a must have for any 50's themed party. 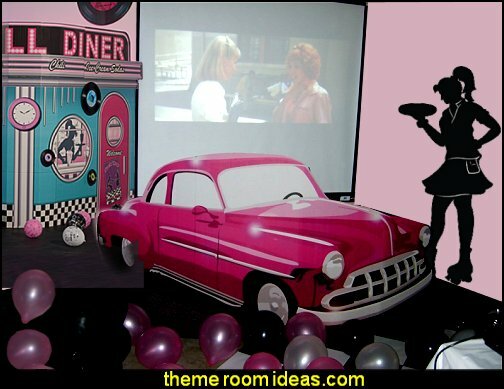 Your guests will love standing behind the prop and posing as their favorite Grease character. Cardboard replica of 50’s and 60’s classic cars make a great addition to your party or event. 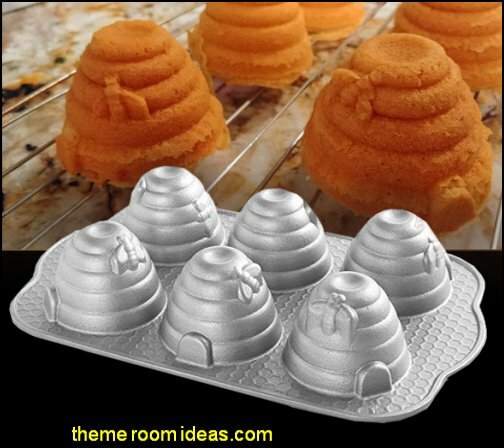 These can be used as center pieces, to hold candy, or to serve meals. They make great centerpieces, decorations, or food baskets. Fill them with candy treats or a Burger and Fries. Fun for kids (and adults) of all ages. 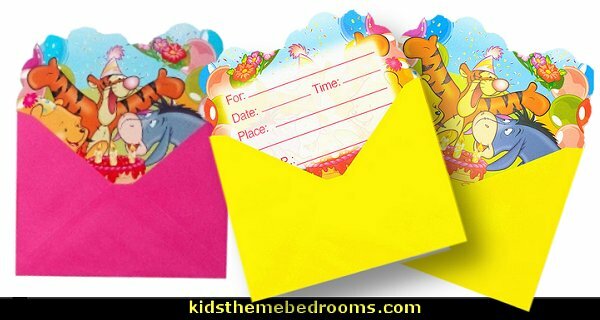 They also make great wall decorations for a kid’s room, office or man cave. 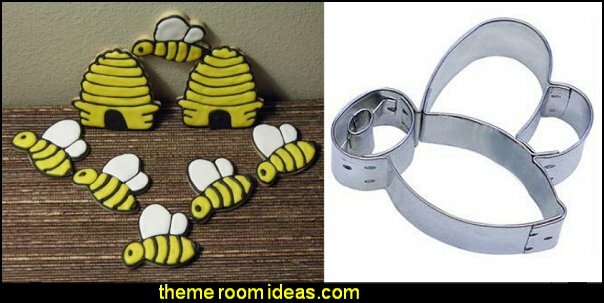 Just assemble them and hang them on the wall with a push pin..
Are these cool or what? 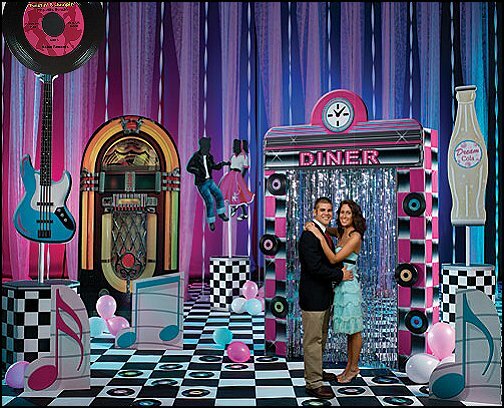 Jukebox Standee is the must-have accessory to add to your next 1950's themed event. This free-standing cardboard prop features a realistic image of a classic jukebox printed on one side. t's time to round up the gang and get everyone down to the Soda Shop for a night that will get all those greasers and bobby socksers hoppin'! Make your tables rock with this 9" plastic record that features a bright label on each side. 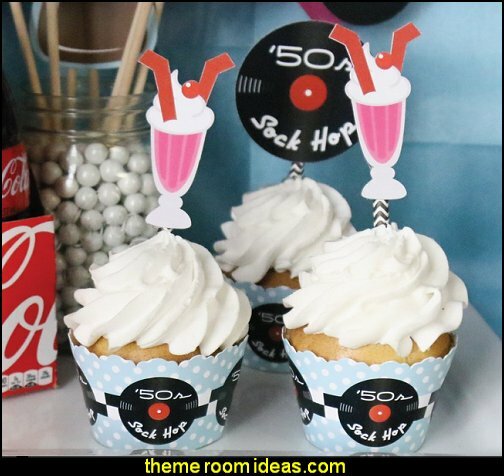 Put a little rock 'n roll around your drinks of the night with these 50's themed coasters that are great to add to any event! This Rock & Roll Cupcake Stand will be the focal point of your 50's theme party dessert table. 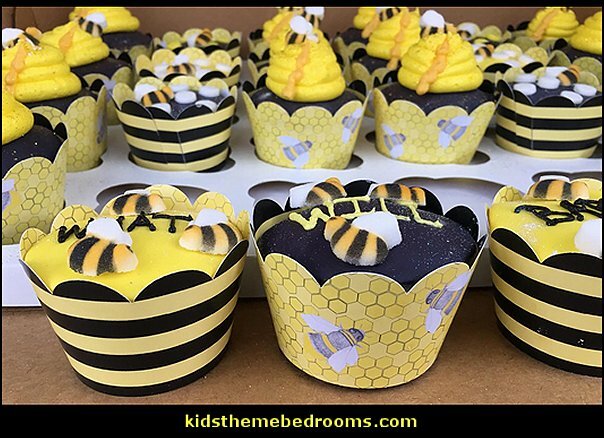 Each stand is made of durable cardboard and holds approximately 15-20 cupcakes or other dessert items. It stands 13 1/2 inches tall and features three record layers. 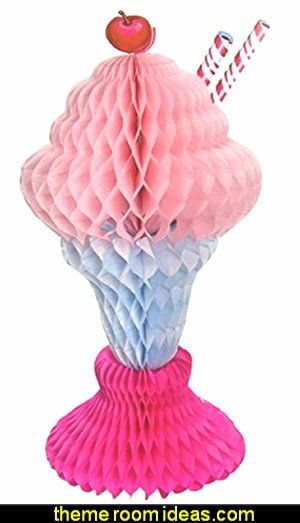 Each Ice Cream Sundae Centerpiece measures 14" tall and is made of paper. 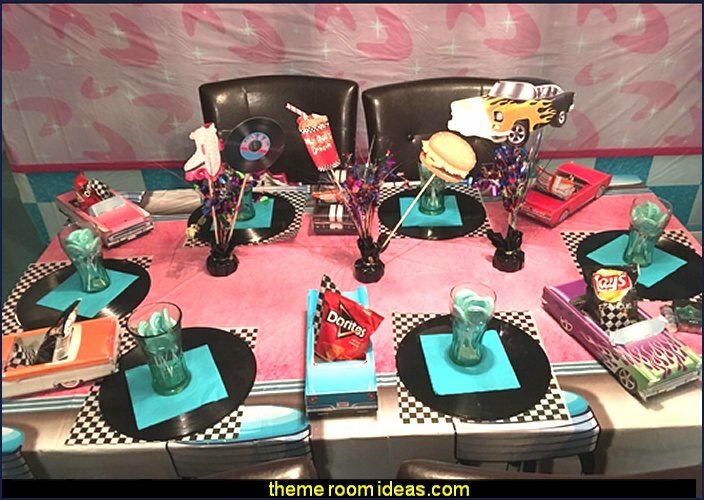 Decorate your 50's themed party table with this centerpiece to get your guys and gals in the mood for a good time! 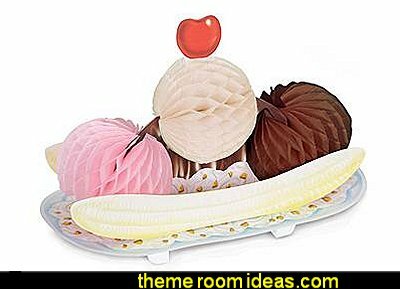 You'll feel like you're at a drive-in diner with this Banana Split Tissue Centerpiece decorating your party tables. 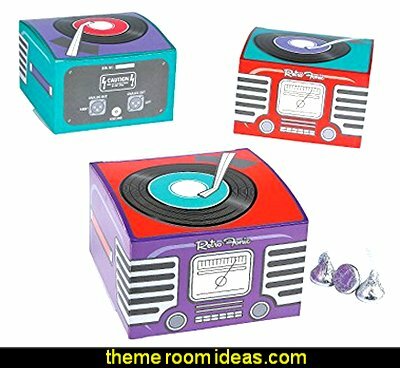 Mini record boxes treat boxes are approx 5" x 5" x 5"
perfect touch for your Fifties-themed celebration. These classic mini jukeboxes can be filled with treats and party favors. 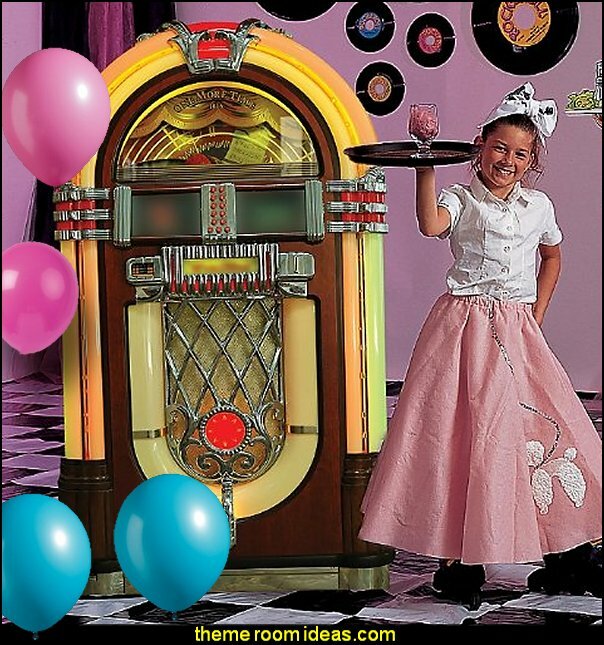 Decorate your 50's party table with this pink and teal Jukebox Centerpiece. 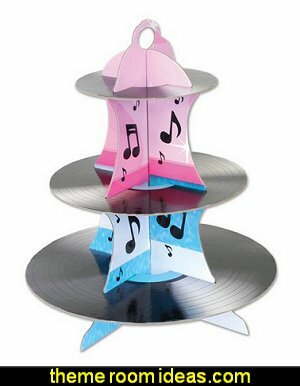 This 15" high, double-sided Jukebox Centerpiece is made from paper and foil and will add a pop of color to any table. Great for your old time rock and roll party! 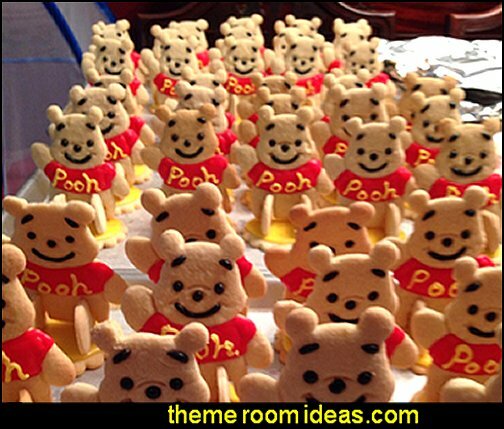 Fill them with sweet treats or salty snacks. 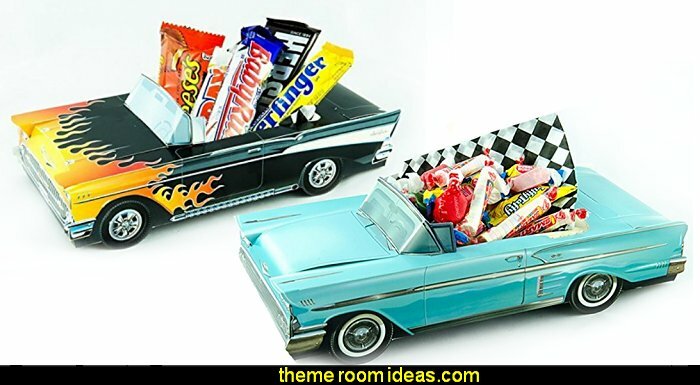 Popcorn, caramel corn, candies and other goodies will look amazing on your candy buffet with these grease themed favor boxes. Shake, rattle, and roll with this Fifties Diner Kit! Grab your poodle skirts and get ready for a rockin' good time! This 1950's Diner Prop is the must-have prop for your fifties themed party with the look of a diner and the sound of a fifties song! Free-standing 50's diner prop is made of cardboard and measures 12 feet high x 11 feet wide x 3 feet deep and includes Fifties Sound Chip. This Car Hop Standees is a black silhouette of a 1950's car hop, complete with roller skates and pony tail. Each cardboard Car Hop Cutout stands 6 feet high x 3 feet 6 inches wide. Easy assembly. 1950's Drive-In Sign features a printed teal sign with lights and a 50's themed sound chip. Personalize the cardboard diner sign with your custom wording. The free-standing sign stands 10 feet high x 6 feet wide. Easy assembly. 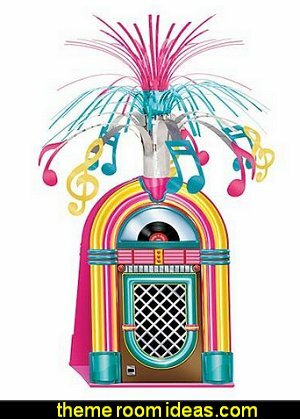 Jukebox Standee Rock around this colossal jukebox at your next fifties themed party! The cardboard jukebox is approximately 3 feet wide x 5 feet high. Free-standing. Easy assembly. Our Giant Soda prop is a fantastic addition to any 1950's themed soda shop. The cardboard giant soda shop prop measures 4 feet high x 3 feet 6 inches and includes red, pin, and white balloons. Assembly required. 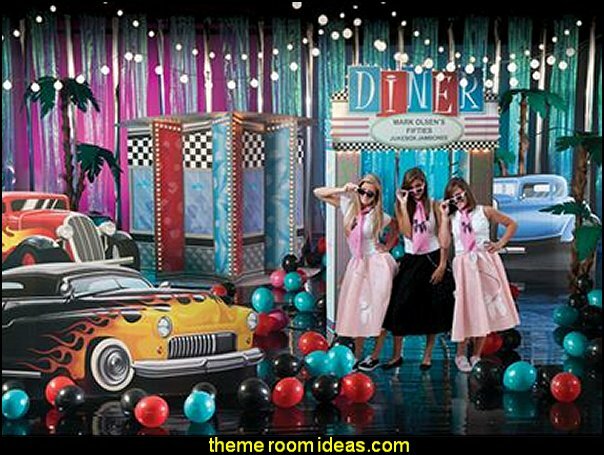 Dig out your poodle skirts, this Fabulous Fifties Theme Kit will make you want to jump n jive. 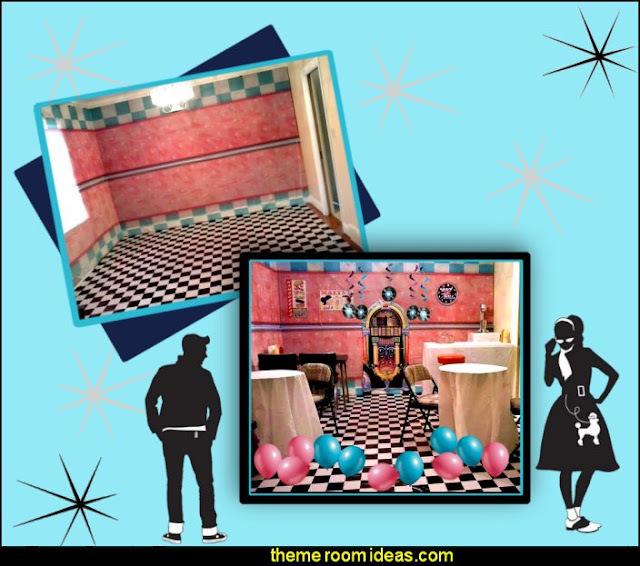 Rock and Roll themed party room! This Hopelessly Devoted Kit will make you feel like you're lost in the 50s again. This 9 1/4 feet high x 4 feet wide x 2 1/2 feet deep 1950s couple sits on top of a black and white checkered base and includes our Fifties Sound Chip. Assembly required. This Cola Pedestal will bring back memories of hot summertime days. Our pedestal is made of cardboard and measures 9 1/4 feet high x 2 1/2 feet wide x 2 1/2 feet deep and includes our Fifties Sound Chip. Assembly required. 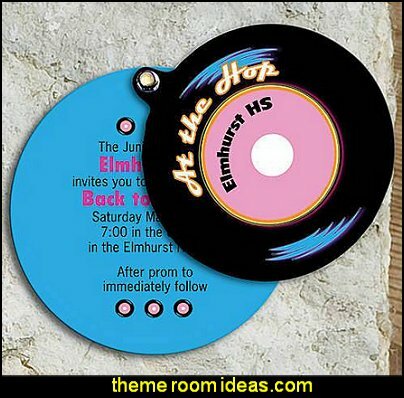 features a black and blue 4 1/4" diameter card stock invitation that has a 45 record design and features your choice of text. It's great for a 50s theme party or any musical event! The Vinyl 45 Invitation includes a brass grommet so your guests can easily spin it open and includes a white envelope. This Guitar Pedestal measures 9 1/4 feet high x 2 1/4 feet wide x 2 1/4 feet deep and is printed on cardboard and includes our Fifties Sound Chip. Assembly required. The Diner Arch gives the illusion that you are walking right into a fifties style diner. This arch is made of cardboard and measures 9 feet high x 5 1/2 feet wide. Assembly required. The free-standing jukebox standee is printed on cardboard to look like neon lights are lit up on the background. Each one-sided Jukebox Standee measures 9 feet 4 inches high x 4 feet 6 inches wide. Easy assembly. Receive a set of 3 Music Note Standees which vary in size from 2 feet 10 inches high x 30 inches wide to 2 feet 10 inches high x 21 inches wide. Easy assembly. 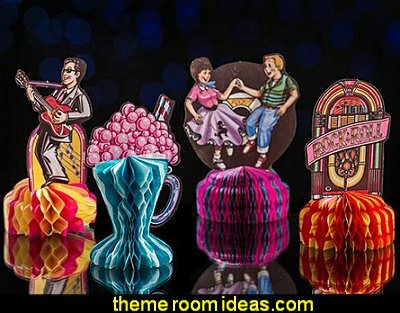 Transform your room into a blast from the past with these 1950's inspired 50's Diner room accents. These 5" x 60" cotton blend scarves are perfect for dressing up any 50's themed outfit. 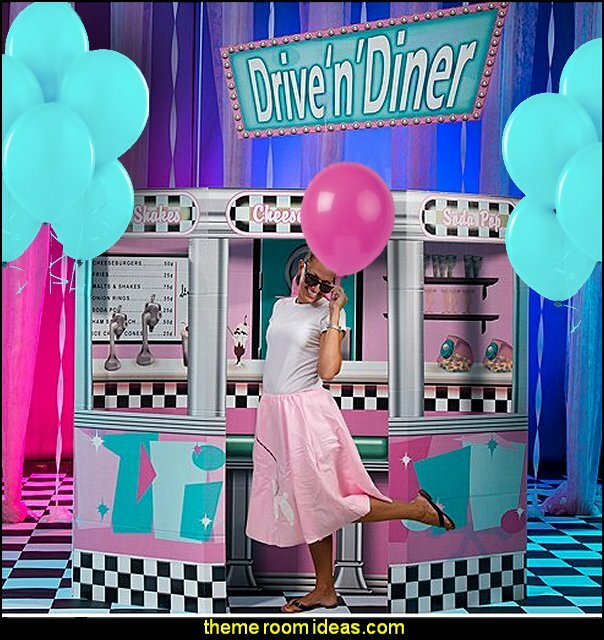 This tasty 7 foot h x 4 1/2 foot w cardboard milkshake makes a great photo setting at your 1950's bash! Assembly required. 5.5' wide x 9' high printed cardboard, includes silver curtains and plastic records, easy assembly. This heavy felt skirt features an elastic waist and an adorable poodle. Choose from either black or pink. 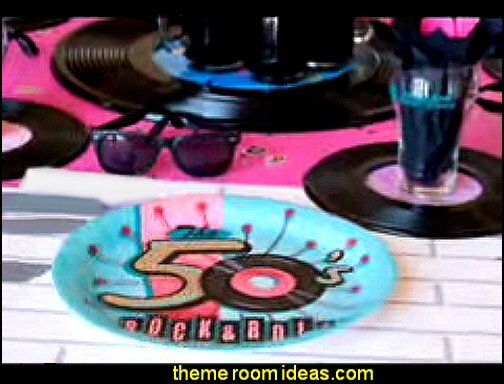 Use these Giant Rocking Records to create place settings, wall decorations, and more. Each set of three cardboard records includes one 31 inch diameter and two 22 inch diameter records. One side full-color print. 6 ft. Car Hop StandeeThis Car Hop Standees is a black silhouette of a 1950's car hop, complete with roller skates and pony tail. Each cardboard Car Hop Cutout stands 6' high x 3' 6" wide. 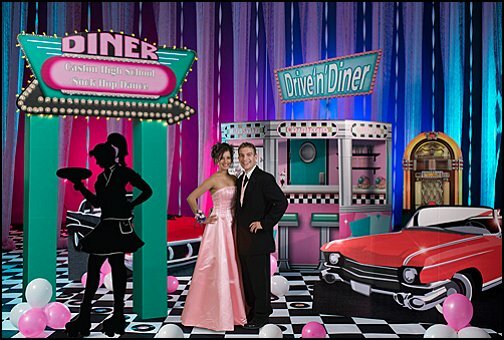 Our 1950's Car Hop Standees will definitely get your event movin' and groovin'! 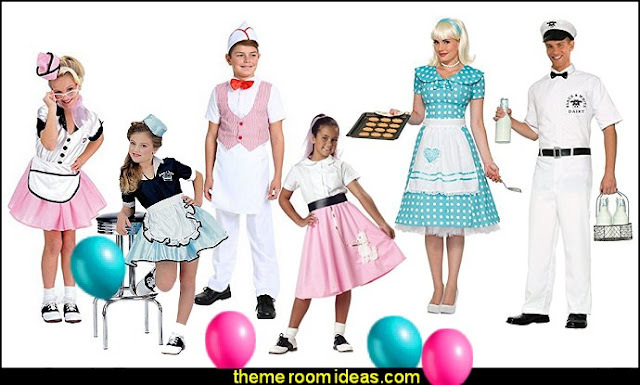 Dance around the clock during your fifties party or 50's theme sock hop! This Rock the Night Away Kit will take you back to the good ol' days of rockin' and rollin' at the diner. 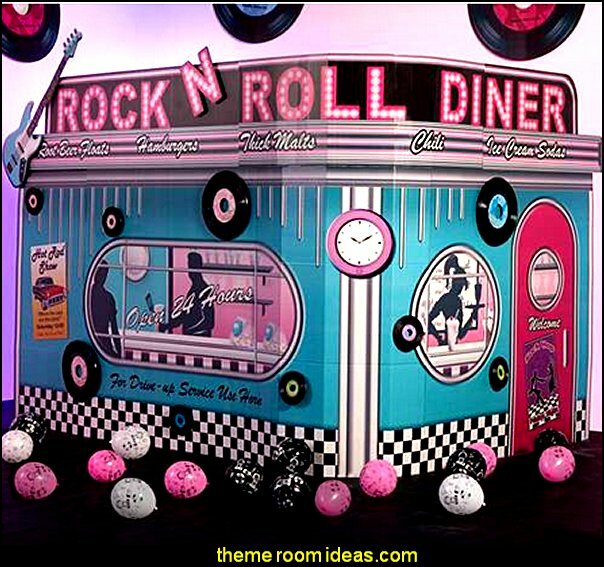 Fifties party decorations are excellent choices for Rock n’ Rollers of all ages, but are especially popular with adults pining for their favorite soda shop. 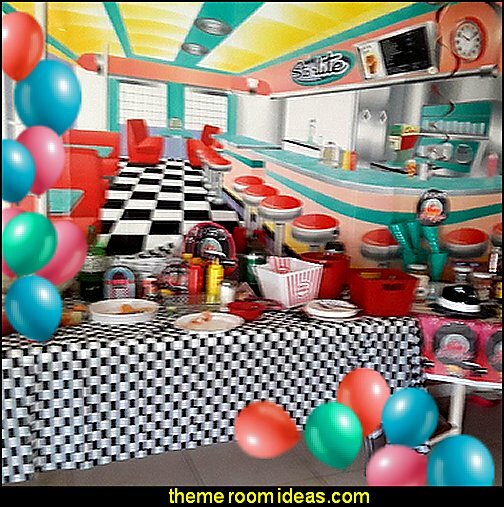 Shindigz has 50's party decorations like the Soda Shop balloon arch to welcome your guests to your soda shop decorated with the 50's diner, and table and stools props. 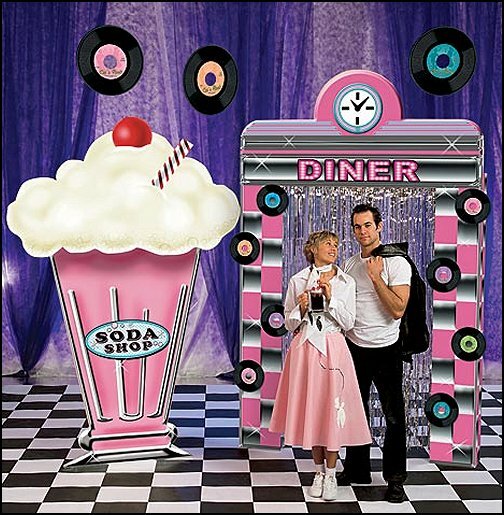 Set giant soda 50's theme party decorations near the tables where guests can make their own ice cream sodas. Cover tables where guests can enjoy their ice cream sodas with fifties party tableware items and root beer float candles to complete your party decorations. 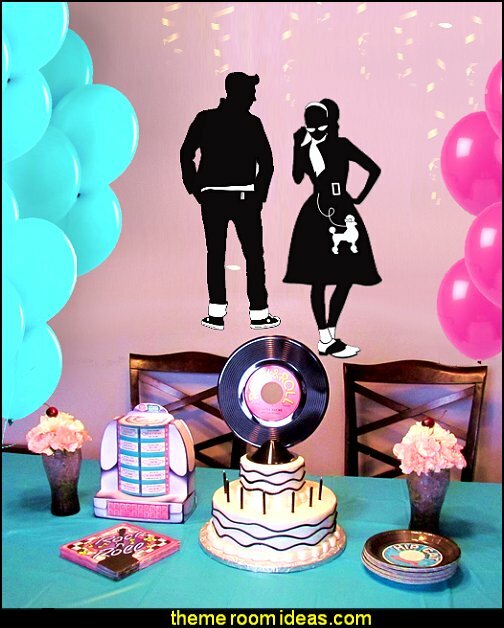 Set the stage for your 50's theme party with decorating kits like the Hopelessly Devoted kit. 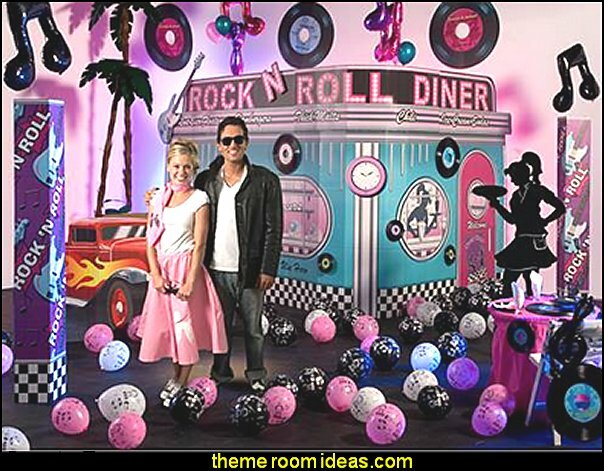 50's theme party decorations and props can also be used outside. For example, put a Hot Rod Pick Up standee in the parking lot for a nostalgic stroll outside. Drive-ins are a natural fit for 50's theme parties. If you can’t get to a real drive-in, set up our large At the Hop Drive-In 50's theme decorations. 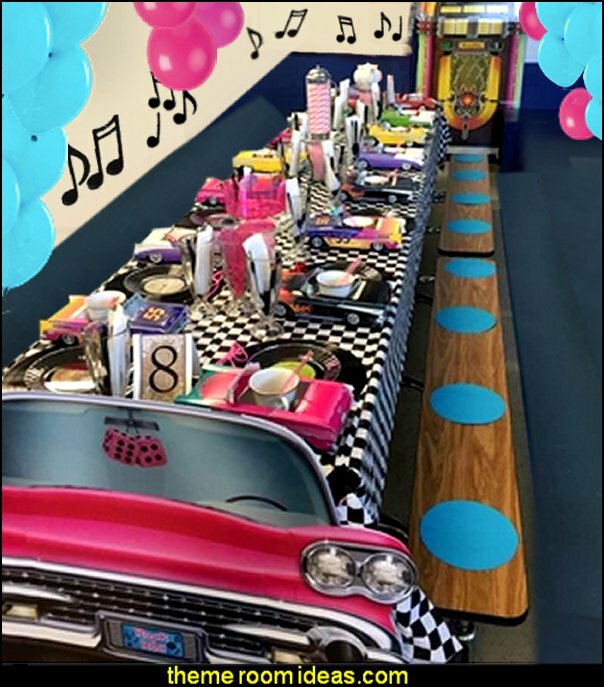 “Twist and Shout – come on, come on, baby now!” - if music is going to be center stage at your 50's theme event, use fifties party decorations that play that out. Hang plastic records from the ceiling and on the walls. 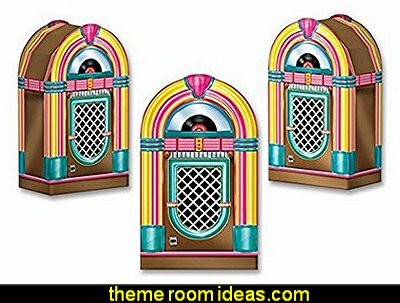 Make the jukebox standee a central figure in your decor. Cover your walls with Black and White Check patterned flat and corrugated paper. 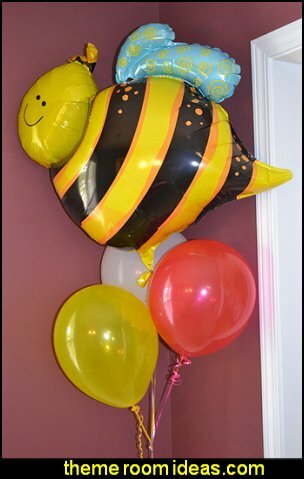 Don’t shy away from the use of balloons to make a huge impact on your 50's theme party decorations at a very low cost! 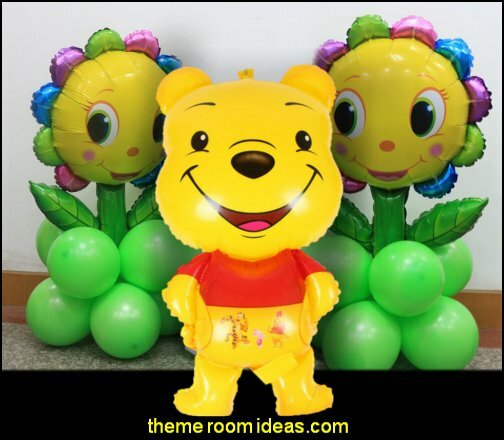 Group latex balloons in your choice of colors for a bright pop. A combination of 50's party decorations and fifties tableware creates the perfect space for guests to catch their breath between songs. Cover the floor with our Black & White Checkerboard poly vinyl. 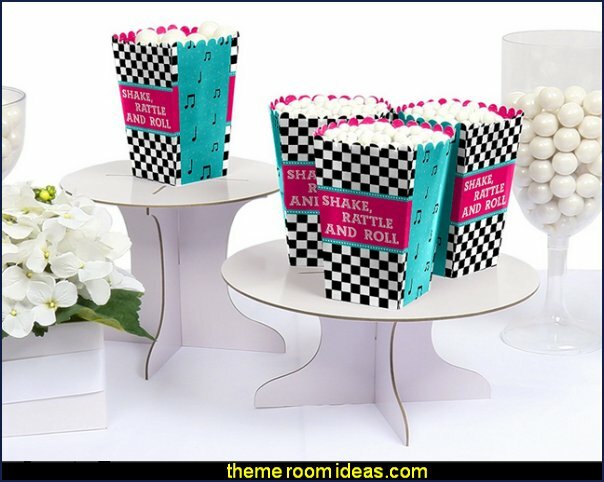 Sprinkle tables with our Rock ‘n Roll 1950's party confetti decoration to extend the magical feel. PLASTIC backdrop is approx 9ft wide x 6ft high once assembled. (please note this is 3 separate pieces, not 1 full piece backdrop) Simple assembly required. You will need to use tape or pins to attach to wall. Great for use as a decoration or photo backdrop. 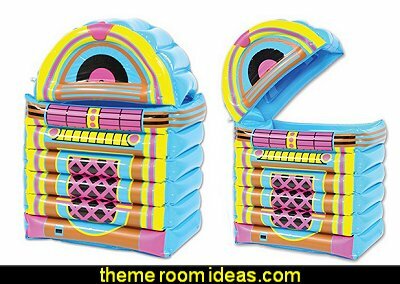 When inflated, this colorful jukebox cooler measures 20 inches wide by 30.5 inches tall. The lid is only attached at one side so that it is able to be opened and shut to get to the inside. Put ice inside this cooler and then add your drinks to keep them cold! The jukebox cooler can hold approximately 24 twelve ounce cans. This is a great item to have at a 50's or rock and roll themed party. Retro diner waitress costume is just the cutest thing on the menu!